Animal rights charities have criticised a controversial project to reduce the number of mink in the north-east and Highlands. Hundreds of the animal are facing slaughter in a bid to save one of the country’s best-loved mammals – the water vole. The latter species has suffered a severe decline since the arrival of the American mink, a predator which spread throughout the country in the 20th century. In response, a project carried out by the Scottish Invasive Species Initiative (SISI) aims to establish and support a network of local organisations and volunteers to engage with their work to remove mink from Aberdeenshire, Moray and the Highland. Volunteers in these areas will make use of mink monitoring rafts, which feature a clay pad on which the animal leaves its paw prints. The clay pad on the raft is changed for a live capture trap if mink are found in the area, and the animal is subsequently killed. However, the decision to cull the creatures has proved controversial. PETA’s director Elisa Allen said: “Culling is a hideously cruel and ineffective way to manage animal populations. Scottish SPCA chief superintendent Mike Flynn said: “The Scottish SPCA is against the culling of species unless there is a risk to animal or human welfare. “Mink are a non-native species and their impact can be devastating to wildlife and the environment, so we do understand the need to control the numbers of mink in the wild. SISI has confirmed it will will carry out the killing of mink in a safe and humane way. Experts from Scottish Natural Heritage and Aberdeen University are both partnering with the project, and have “extensive” experience in invasive species control work. 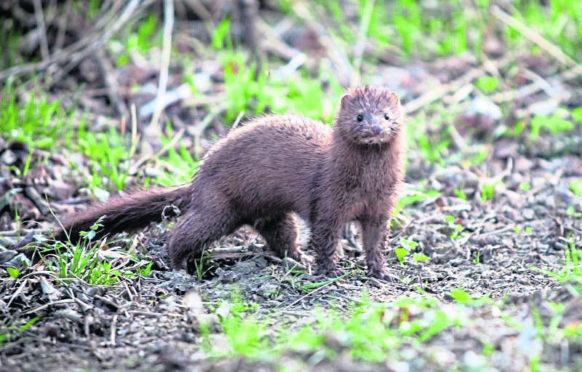 The project’s manager, Callum Sinclair, said; “Invasive non-native species, such as American mink are a big threat to the native wildlife of Scotland so it’s crucial we address the problem. Workers would need to visit the raft every couple weeks and check for the tell-tale sign of mink footprints in the clay.